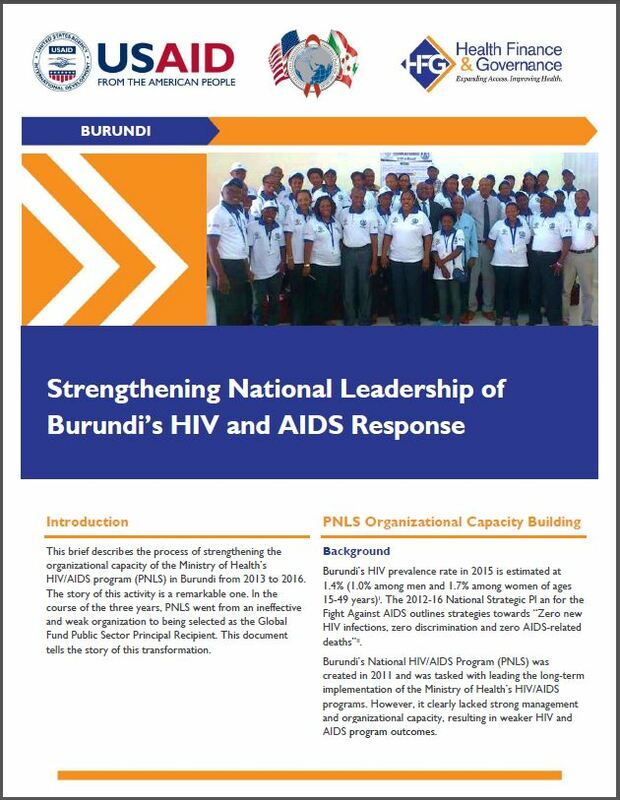 This brief describes the process of strengthening the organizational capacity of the Ministry of Health’s HIV/AIDS program (PNLS) in Burundi from 2013 to 2016. The story of this activity is a remarkable one. In the course of the three years, PNLS went from an ineffective and weak organization to being selected as the Global Fund Public Sector Principal Recipient. This document tells the story of this transformation. Burundi’s National HIV/AIDS Program (PNLS) was created in 2011 and was tasked with leading the long-term implementation of the Ministry of Health’s HIV/AIDS programs. However, it clearly lacked strong management and organizational capacity, resulting in weaker HIV and AIDS program outcomes. PNLS’s lack of such capacity resulted in strategies that were not operationalized, programs and plans that were not well implemented, stakeholders that were not well coordinated, provinces that were not able to plan and manage their activities, and inadequate mobilization of resources, all of which contributed to weaker HIV/AIDS outcomes. To address PNLS’s lack of organizational capacity, USAID/Burundi requested assistance from the Health Finance and Governance (HFG) project. Over a three-year period beginning in 2013, HFG worked closely with PNLS staff to develop their organizational capacity. PNLS is comprised of 38 staff assigned to five divisions – Preventing Mother-to-Child Transmission (PMTCT), Care and Treatment, Monitoring and Evaluation, Community Mobilization, and Management. The program is led by a Director and his Deputy Director. Toward Country-owned HIV Responses: What Strategies are Countries Implementing to Achieve Sustainability?